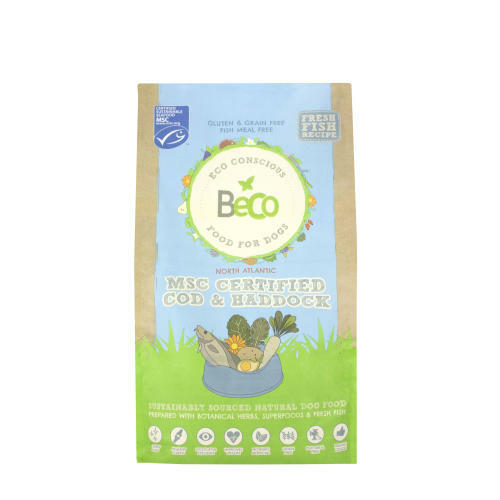 Beco MSC Certified Cod & Haddock Dog Food is a natural, nutritious and healthy dry food made in an eco-conscious way, using only fresh and sustainably sourced, high-quality ingredients. The balanced recipe uses fresh fish and locally sourced vegetables & herbs, all enriched with super foods to give your dog the boost he needs! This recipe is completely free from grains, preservatives, additives & meat derivatives. What you see on the bag is what you get! •	Free from meat and fishmeal, which is a low cost, powdered fish form often used in other pet foods. Only freshly prepared, high quality fresh fish is used in Beco food. •	Bursting with natural prebiotics and super foods, including; Kale which is one of the worlds most nutrient-dense foods packed with vitamin A which aids urinary health; Chicory, a world-class pre-biotic and source of inulin which supports bone health and digestion; Pumpkin which is a rich source of fibre. •	Only sustainably caught fish is used in this food. It’s rich in Omega 3, which helps your dog produce a healthy, shiny coat and skin. •	Made in the UK with a low carbon footprint. 40% Freshly Prepared MSC Cod & Haddock, Potato, Peas, Chickpeas, Potato Protein, Pea Protein, Sunflower Oil, Brewer’s Yeast, Lucerne, Minerals, Vitamins, Salmon Oil, Fresh Free Range Egg, Broccoli, Kale, Vegetable Stock, Chicory, Bilberry, Mulberry, Chamomile, Rosehips, Milk Thistle, Burdock Root, Stinging Nettle, Cleavers, Fennel, Marigold, Aniseed, Fenugreek, Grapeseed Extract, Spirulina.